I don’t know about you, but I’ve enjoyed H. Moser & Cie being around lately. They’ve put a smile on my dial, while creating some of the best examples of watch dials ever created. It’s like about five years of guffaws and loud sniggers, accrued through full-time work in the watch game, and previously hidden behind a hand, were allowed to escape. I could finally, finally, laugh out loud at an industry that never — literally never — laughs at itself. Moser’s new mission in satire is in aid of finding the perfect launch concept for their Pioneer Collection, called ‘The Pioneer Chronicles’. The first of the ‘Pioneer Chronicles’ videos was aimed at what is admittedly a brilliant and effective campaign. You know the one. “You never actually own…” As a dad, I like that after years of dreading my daughters coming of age for a whole raft of reasons, I now feel less pressure to give them my watches — which is one major stress alleviated. There, I said it. The second video addressed brand ambassadors, and the risks therein. It’s a ‘funny because it’s true’ video. Moser jokes don’t always stick, but they’re always aimed in the right direction, and if it’s not a belly-laugh, it’s a snigger. 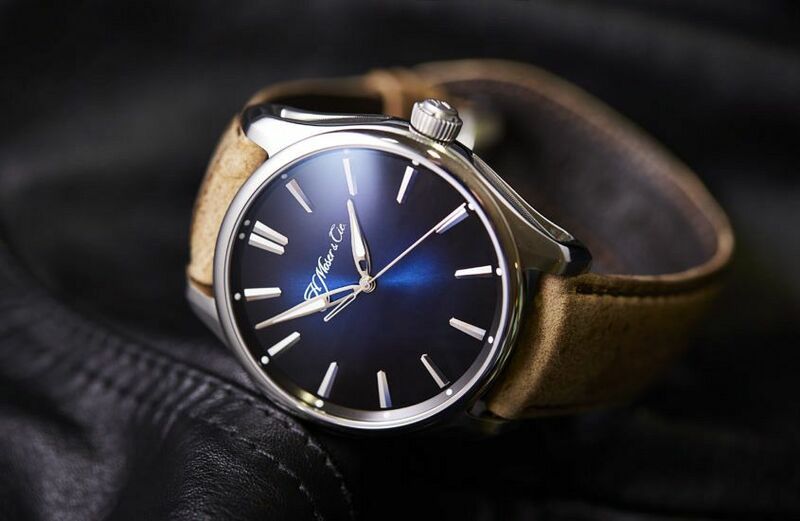 The H. Moser & Cie Pioneer in steel with midnight blue fume dial. Form an orderly queue. The third and final instalment, which we are super excited to break to the world, is my personal favourite. Mainly because it is about my life. This episode takes on the cliche of watches being connected to nostalgic adventures. To a certain brand of rugged masculinity. North Pole yardiyarda, Mount Veryhigh yardiyarda, the Marinara Trench yardiyarda. All lovely, but my adventures lately have not involved mountains of untrammelled earth, but mounds of nappies. While bearded hipsters were exploring the Hudson River in kayaks, I was wandering up and down aisle six at Safeway looking for more baby formula at 3am because we ran out again. I’ll stop stealing the video’s thunder now. If you’re a dad you have to watch it. If not, you’ll laugh anyway (and be afraid). As a final point, the humour Moser bring to the industry is welcome. But it’s not needed. Their watches are achingly beautiful objects, finished and fussed over to an obsessive degree. Case in point, I bought the Pioneer that the campaign is promoting before I saw any ad campaign. That said, this is a tribe I can get behind on a lot of levels.